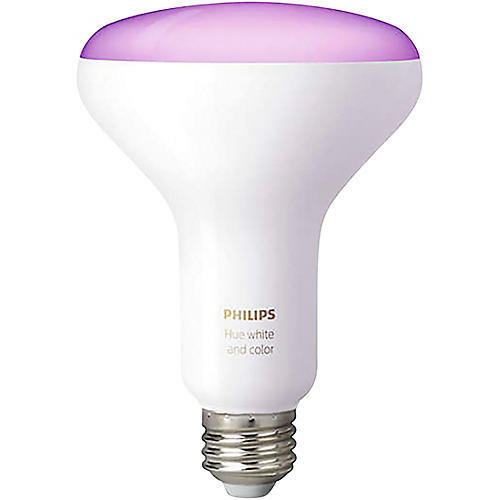 The Hue White and Color Ambiance BR30 Single Bulb now with enhanced color is an extension to your Hue ecosystem. As an addition to your personal wireless lighting system, the Hue White and Color Single Bulb and your Hue Bridge provide you with full control of your lighting from your smart phone or tablet. With all shades of white light and all colors to choose from, there are limitless possibilities to turn your everyday lighting into an extraordinary experience. With Hue, you can paint with light and change the mood of your home to match any moment with just the press of a button. You can customize your daily routines, using preset shades of white light to help you energize, concentrate and relax throughout the day. Let Hue wake you up gradually for a fresh and gentle start to each day instead of an abrupt alarm and relax with a cozy, warm, light gradually turning off as you fall asleep. If you are working late or away on vacation, you can make it seem like you are home when you are not with Hue's away-from-home control, allowing you to change your lights from anywhere. In addition, when you do return home, Hue can welcome you with a lit house as your approach. You can even set the lights to come on at a pre-set time and turn off gradually. Hue can synchronize to your music and movies by lighting up to the beat of your favorite song and transforming any room into a dance floor.